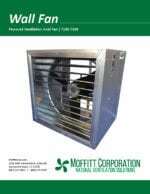 Moffitt 7100-7300 Power Fan industrial axial wall fans are extremely popular for general building ventilation. Their versatility provides great application diversity. 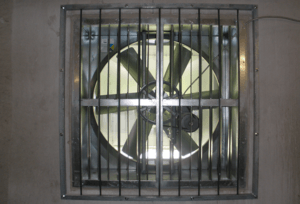 Fans are used in both industrial and commercial applications and can be orientated for either supply or exhaust applications. Units are excellent for providing worker comfort, and spot cooling when used in supply mode. Numerous optional wall fan features offer you flexibility unmatched by any other fan supplier. Complete Operation & Maintenance instructions along with assembly drawings, supplied with fan shipment. Units are wall mounted at various heights for intake or exhaust applications.